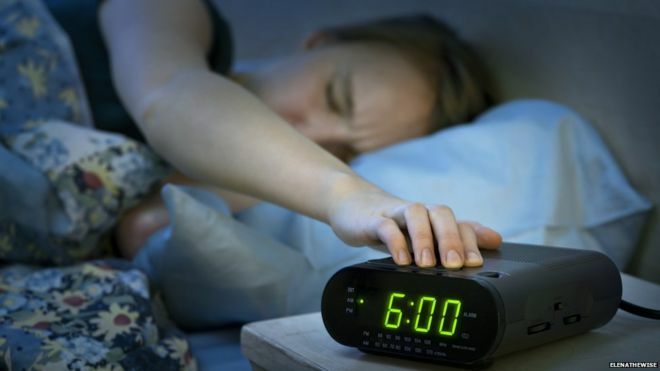 Scientists in Canada have launched what is set to become the world’s largest study of the effects of lack of sleep on the brain. A team, at Western University, Ontario, want people from all over the world to sign up online to do cognitive tests. 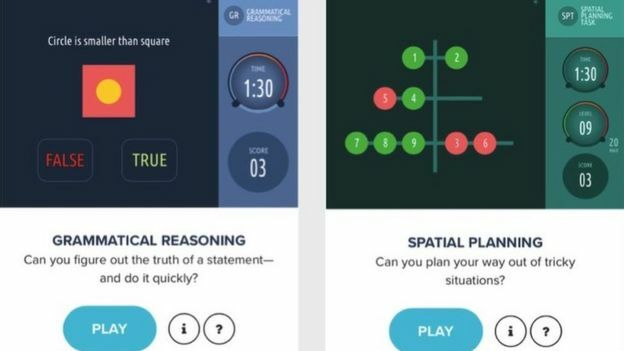 The specially devised computer games test skills such as reasoning, language comprehension and decision-making. I joined a group of volunteers trying out the tests and had my brain scanned while doing them. Prof Adrian Owen, a British neuroscientist based at the Brain and Mind Institutein London, Ontario, is leading the study. The team will collate the cognitive scores and see the variations depending on how much sleep people have had. Everyone’s sleep requirements are different, but if enough people join the study, it may allow scientists to determine the average number of hours needed for optimum brain function. I joined four volunteers spending the night at Western University, where we road-tested the brain games and were able to demonstrate how lack of sleep affects cognitive performance. 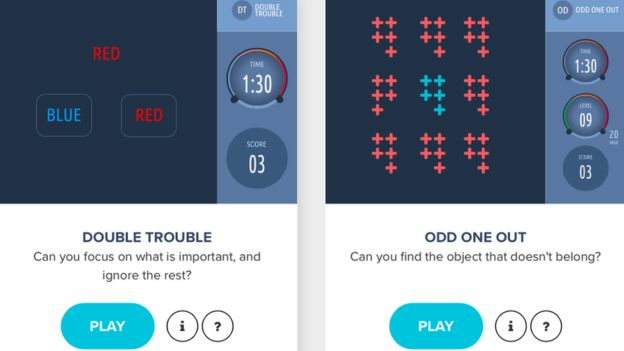 The tests can be played on any computer, tablet or smart phone. Double Trouble: This looks simple but really stretches the grey matter. You have to click on the word below that corresponds to the colour in which the word above is written. So, if the word at the top is “blue”, but is coloured in red, you must click on the word below that is coloured red, even if it is written as “blue”. Fiendish. Odd One Out: This starts simple but gets increasingly complex as you try to find the one shape that is different from the others. Grammatical reasoning: Is the statement about a diagram true or false? Sounds easy, until you begin dealing with negative statements. Spatial planning: This tests the ability to plan ahead – like all the games, it measures cognitive skills we use repeatedly during the day. After staying up until 04:00, we were allowed four hours’ sleep. When we re-did the cognitive tests later in the morning, Evan, Cecilia and I scored significantly worse than we had the night before. Hooman – who is used to being on-call and responding to patients – did not see much of a dip in his score, while Sylvie’s actually improved. I have long known that I don’t function well when sleep deprived, so it was no surprise that my cognitive scores dipped dramatically in the morning. In order to find out what might be happening in my brain, I repeated the cognitive tests while inside an MRI machine. I was scanned twice – after a normal night’s sleep and then after the sleep-deprived night. 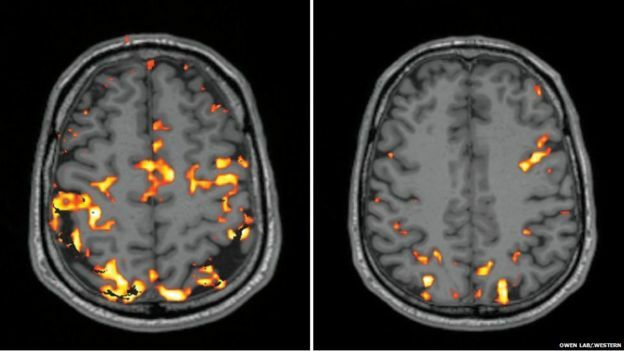 The functional MRI scanner is able to detect blood flow in the brain – so the areas that are working hardest show increased levels of activity, shown as orange coloured blobs. The comparison between the scans was stark: after being sleep deprived, my brain was well under par – there was much less going on up there. We all know that it is dangerous to drive when tired, because our reaction times are impaired and we might fall asleep at the wheel. But the more subtle effects of sleep deprivation on day-to-day living are far less understood. We spend nearly a third of our lives asleep, and it is as vital to our wellbeing as the food we eat and the air we breathe. But our 24-hour culture means we are getting less sleep than ever. Last month, a paper in Nature Reviews Neuroscience said there was “remarkably little understanding” of the consequences on the brain of chronic sleep loss. It spoke of the “precipitous decline in sleep duration throughout industrialised nations”, adding that more research was urgently needed. Those who volunteer for the sleep study may help find some of the answers needed by both science and society.